This year, as usual, ACDA’s our community feast or gathering will take place on Monday December 26th which is the first day of Kwanzaa Umoja (Unity). On this day the entire community assesses its failures and accomplishments, and establishes goals for the upcoming year, in achieving the principles of Kwanzaa. Elders, youths, and other persons who have upheld any of the principles are honored accordingly.Since Kwanzaa is a family oriented celebration, the entire family is expected to participate. The program starts at 11 AM at ACDA’s headquarters, Thomas Road, Thomas Lands. Admission is free. Cultural food is on sale. Kwanzaa was initially put into motion by Dr. Maulana Karenga, in the year 1966. Kwanzaa builds on the five fundamental activities of Continental African “first fruit” celebrations: in gathering; reverence; commemoration; re-commitment; and celebration. Kwanzaa is a time of gathering for family and community coming together where people can renew and reinforce bonds between them. It is a time of special reverence for the Creator and creation, both a thanksgiving for the earth and a re-commitment to protect and preserve it. – a time for celebration of the Good, the good of life and of existence itself, the good of family, community and culture, the good of the awesome and the ordinary, in a word the good of the divine, natural and social. Before December 26, the first day of Kwanzaa, the day of Umoja or Unity, the entire house is cleaned. The home is then dressed in the colours of red, green and black. African motifs are often displayed along with other cultural articles. 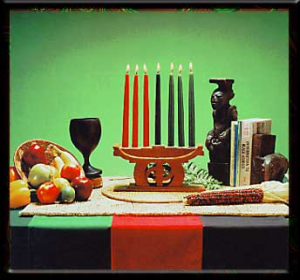 The Kwanzaa table or corner is set up in the home. The table consists of the Kwanzaa symbols. First the straw mat is laid. On this mat rests the other symbols and articles. The candle-holder with the seven candles is then placed on the mat, along with the bowl of fruits and ears of corn. Any other product which the family has produced during the year can also be displayed. On the morn of the 26th, the entire family gathers around the Kwanzaa table. Libations are offered to the creator and ancestors.. The family then discusses their failures and achievements in fostering unity in the family and community over the past year. The candle of Umoja is then lit. It is important that the children and elders participate in the ceremony with the view of bridging the generational gap, thus continuing the tradition. If anyone has exemplified this principle during the previous year, Zwadis or gifts are given. This ceremony is repeated with each principle being the center of discussing for the next seven days. Kwanzaa was introduced in Guyana in the 1970s. However, it did not become part of the African-Guyanese cultural calendar until 1992 when the newly formed African Cultural and Development Association (ACDA) revived the celebration and held its first observance.